Thinking about politics lately has naturally led me to thoughts about lying. Lying is one of those odious things that all of us have done at one time or another, but that good people try not to do. I used to try to lie when I was younger, but I was never any good at it. I always found myself getting in more trouble because of the lie than I would have gotten in if I had just stepped up and had the courage to tell the truth. My last big lying experience happened shortly before Fluffy and I got married, when I got the bright idea to make a shadow box that told the story of Fluffy and me to use as the photograph on our wedding announcement. 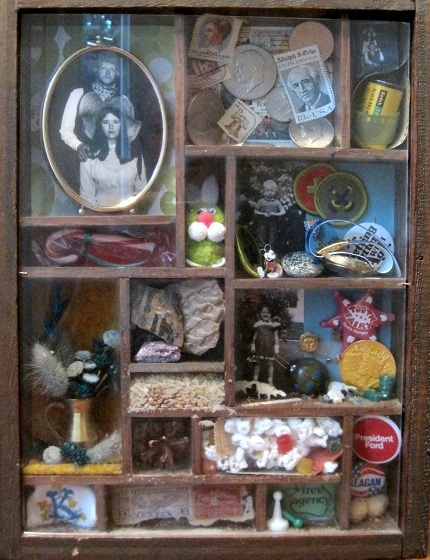 I have attached a picture of that shadow box here, just to let you know that this was one of those “What were you thinking?” ideas from the very inception. Note the dark blue flowers in and underneath the pitcher. At the time, I thought this was just the coolest idea on the planet, and Fluffy either agreed with me or he didn’t care enough about what went on our wedding announcement to tell me I was crazy. So he made the shadow box, and I found things to put in it that represented our courtship. You’ll notice the picture of Fluffy and me, all decked out in Wild West regalia even though neither of us had any interest whatsoever in the Wild West. The wallpaper behind our picture is the wallpaper that was in the dining room of the first house we owned. In my defense, the wallpaper came with the house, but since I’m trying to be honest in this column I need to confess that at the time I thought it was beautiful. There is a section containing popcorn and Jujubes, along with movie stub tickets to indicate our interest in movie-going back in those days. There was an old stamp we found behind a wall in our new home, as well as stamps and coinage of 1976. There were pictures of Fluffy and me as little children. There were political campaign buttons. There was a game token from a game that Fluffy and I created and that was published by Bookcraft. There was a bunny, because even then Fluffy and I had already adopted the bunny as our totem animal. And if you’ll look, there’s a tiny brass vase, filled with tinier dried flowers. About a half dozen of them are a very dark blue — a shade of blue that God apparently never intended to be a flower color, because I’ve never seen a real flower that was anywhere near that hue. The dark blue flowers are the focus of my attention as I write this, because therein lies the tale. I don’t know where I got the little brass pitcher. It really didn’t have anything to do with our courtship. I put it there more because I needed to fill a particular space in the shadowbox than for any actual reason. But if you’re going to have a pitcher, you need to put flowers in it. At least, that was my reasoning at the time. I went downtown to a huge craft store, looking for tiny flowers. There I found them — those dark blue things you see in the picture. There was only one problem. I only needed a few of them, and they were being sold in a package that contained hundreds. I’d say the diameter of the stems that were tightly tied together in each bunch was a good three and a half inches. There were at least 500 flowers in each bunch, and probably two or three times that many. $5.99 in 1976 had the same buying power as $24.36 in 2012. Whoa. I had no idea there was that much difference. But you can see why I didn’t want to pay $5.99 for more than 500 flowers when I eventually used less than ten of them. So I did what I thought was the reasonable thing to do. I marched up to the checkout counter with the bunch of flowers and explained my situation. I said I wanted just a few flowers for my wedding invitation but I couldn’t afford the whole bunch, and I offered to pay a quarter for just a dozen or so of them. Whoever purchased the bunch eventually wouldn’t miss the few flowers I’d take, and the store would be 25 cents (which, according to the website, is $1.02 in today’s money) richer. Apparently what I thought was logical was not logical in the mind of the prune-faced granny behind the checkout counter. Instead of saying, “Dear, nobody will even miss a few of those flowers,” she scowled at me and said if I wanted any flowers I had to buy the whole bunch. Period. As I went to take the flowers back to their place on the shelf, I seethed. This was not fair! So I rationalized that I would just take the stupid flowers. And that’s exactly what I did. I think I took ten of them. The bunch of flowers looked no smaller after my thievery than they did before. Truth be told, I could have taken fifty flowers out of a bunch that size and nobody would have been the wiser. I put the flowers in my pocket and absconded with my treasure. I made the shadowbox, and life was sweet. Except — well, except that every time I looked at that shadowbox, all I could see were the flowers I had stolen. I knew I was going straight to hell. I didn’t want to confess my sin. The way that store employee acted, she would have pressed charges if I’d told her the truth, and I would have ended up in jail. So I went all the way back downtown, returned to the store, and compounded my thievery by lying to cover it up. Here’s what I did. I took a quarter out of my purse, looked around the store for a few minutes, and then took the quarter to the checkout counter. “I found this on the floor,” I said. If I had given the quarter to the prune-faced granny who dealt with me before, she would have taken that quarter so fast she probably would have taken a finger or two with it. But as fate had it, Prune Face was not there that day. The sweet granny who was at the checkout counter instead broke into a huge smile. Try as I might, I couldn’t talk her into taking the quarter. So I walked around for a few more minutes and discreetly dropped the quarter on the floor where somebody else (presumably a store employee) would find it. Then I went home. That second lie didn’t make it any easier to look at the shadowbox. My ill-gotten flowers are still there for anyone to see. But they stand as a constant reminder to me that liars just don’t prosper. Ever since my experience as a flower thief, I have done my best to stay away from lying. I still have a problem with exaggerating, but when I catch myself I back off fast. Maybe nobody will catch me if I lie. In fact, probably nobody will catch me. But it doesn’t matter, because I’ll know it. And my opinion is the one that matters.